The most recent study on the link between oil price and economic recession came from energy industry consultancy Wood Mackenzie (WoodMac) published earlier this month. The chart below from WoodMac illustrates “the mechanism” of how an oil price shock would derail the global economy. U.S. domestic petroleum products are priced off of Brent since WTI has become a less relevant oil price marker due to the inventory glut at pipeline-capacity-challenged Cushing, OK depressing the WTI price. 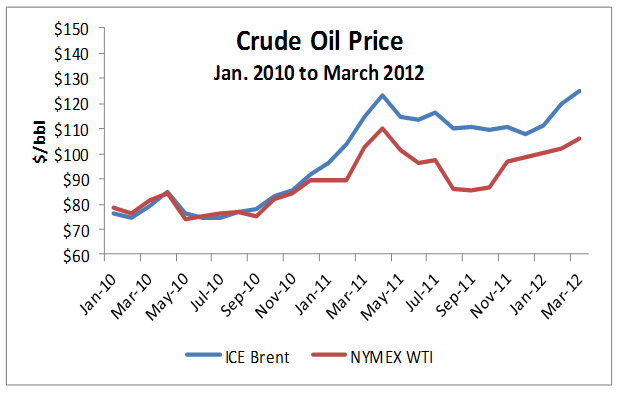 So using the current spread between WTI and Brent of around $15-$20, WTI $130 would suggest Brent at about $150 range. Brent futures already hit $128.40 a barrel, the highest since 2008, in early March, but has since given back some of the gains..
Rather than reflecting market fundamentals, dollar prices for Brent crude, up more than 15% this year, has been pushed up mainly by fears about Iran, and the loss of supply from three relatively small oil producing countries–Syria, Yemen and South Sudan–adding to the supply worries. In other words, the oil price is bid up primarily by trading actions on the geopolitical factors (chiefly Iran). So no, unless something totally unexpected shocks the oil price into no man’s land, WTI and Brent are unlikely to hit the levels that could possibly bring about a global recession any time soon. In fact, among the major possible drivers of a global recession, European economic and debt crisis looks to be the greater risk than an oil price shock.